Looking for Muslim-friendly accommodation while in Bintan? We’ve got you covered. The first step to planning any vacation is selecting a comfortable and reasonable accommodation so you can put your feet up, relax and make yourself at home wherever you are. An added bonus if the hotel provides essential Muslim prayer tools! Fret not, we have put together a list of CrescentRated hotels in Bintan. You can also book hotels online with HalalTrip, and filter them according to the Halal friendly Crescent rating. 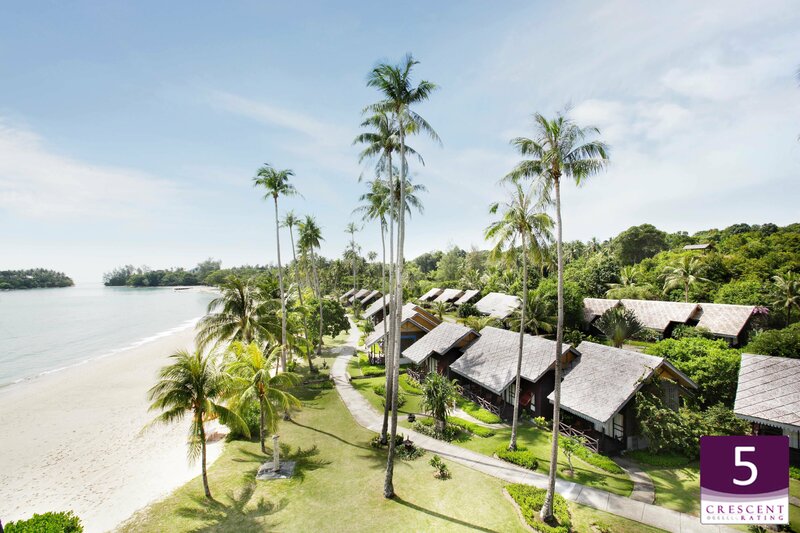 Take a break from the hectic city life, a few nights at Angsana Bintan is sure to give you the peace and tranquility you need. CrescentRated 5, Angsana Bintan is the ideal place for urbanites looking for a serene retreat. Sports lovers will be fascinated by the 18-hole golf course and the tennis courts available for use at Laguna Golf Bintan. Spend a well-deserved day at the Angsana Spa to rejuvenate your senses. This is one of the best resorts in Bintan to stay at if you’re traveling with family. 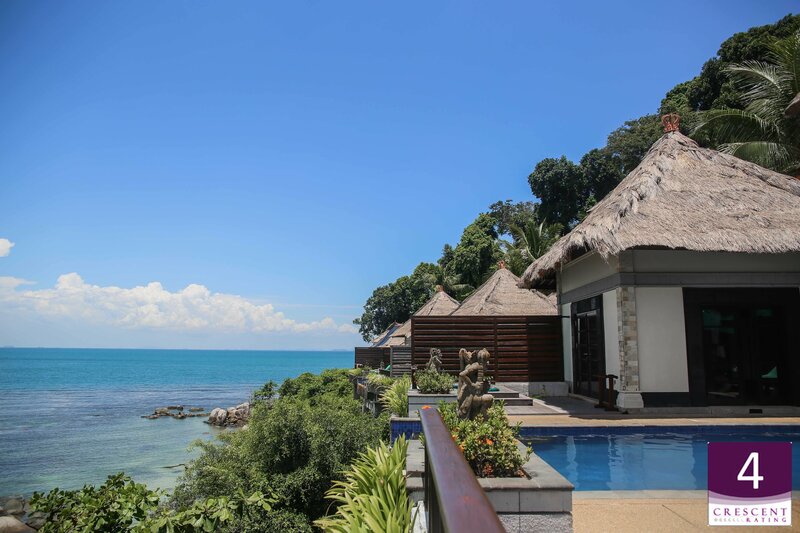 Another one of the top-rated resorts of Bintan Island is the newly renovated Nirwana Gardens. Spanning a large area, you will be spoilt for choice at this CrescentRated 5 resort with five accommodation options. 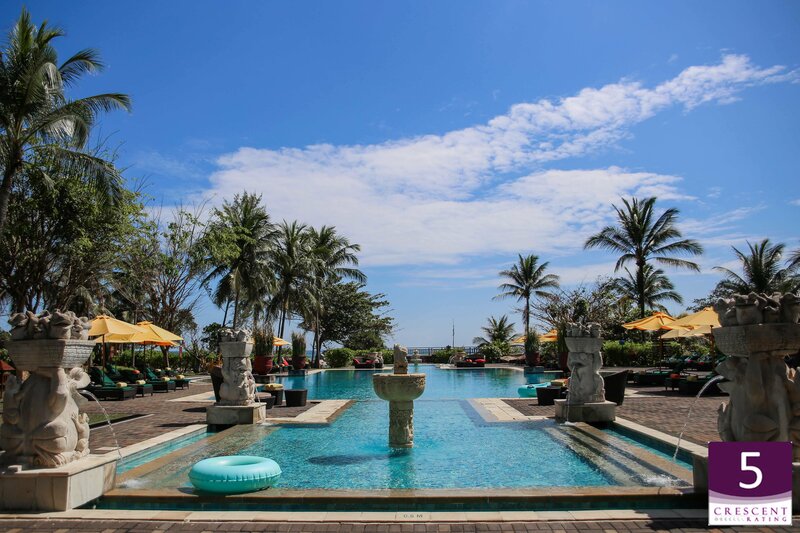 Choose from Nirwana Resort Hotel with over 245 rooms, 50 air-conditioned thatched-roof chalets arranged in clusters of four at Mayang Sari Beach Resort. Indulge in the lavish fully-furnished two and four bedroom villas that are perfect for family get-togethers and group gatherings at Banyu Biru Villa, and lastly Indra Maya Pool Villa which showcases a lavish side to Bintan with a view overlooking the South China Sea and a private pool. Beach and sport lovers will be delighted by the extensive beach activities from parasailing to scuba diving. Whatever your purpose – a family visit, a relaxing time spent alone, a honeymoon, a business get-together- Nirwana Gardens will be able to cater to your needs, making it one of the best hotels in Bintan Island to stay in. If you’re looking for an exclusive villa experience with easy access to the beach, Holiday Villa Pantai Indah is the place to be. The villa is popular with couples and families with children due to the large rooms and privacy it offers. The beaches overlook a cluster of small islands where there is an abundance of exotic marine life, making it an ideal spot for scuba diving and snorkeling. The 40 fully-furnished villas are each accompanied with private swimming pools which is perfect for Muslim women who prefer to relax and unwind in privacy. If you feel like exploring outside the resort, you can take the shuttle service to Plaza Lagoi for some shopping followed by dinner at Halal friendly Warung Yeah which has been rated CR-AA! Enjoy an evening stroll through Lagoi Bay’s latest opening, Lagoi Bay Lantern Park, which features the endangered species of Indonesia in vibrant, brightly lit larger than life lanterns. All of which is just a short walking distance from the mall. Ever wanted to try glamping but never got around to it? The Canopi will be your dream come true! Indulge in the best of both worlds by spending the night close to nature, hand in hand with the luxury and ease offered by modern amenities; from air conditioning to a colonial styled workstation and a posh four poster bed. Explore the nature around you, or spend your time relaxing at the spa. Male therapists are available but you will have to request for them in advanced. Continue spending your day with activities at The Canopi even after checkout. You don’t have to worry about where to pray as the resort offers an on-site prayer room! 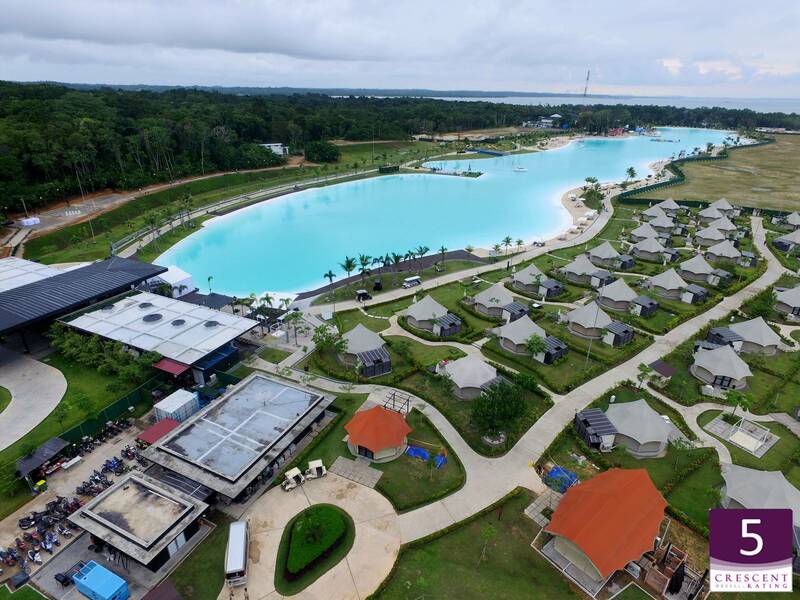 Try your hand at the various water sports or just relax by Crystal Lagoon, the first and largest recreational saltwater body in Southeast Asia, at Treasure Bay. For guests who prefer to stay dry, land activities such as Segway, electric scooter rental and ATV and mini-ATV are available as well. Get ready for a day of fun in the sun for the young and the young at heart! Where serenity meets luxury, Banyan Tree Bintan boasts 64 villas each offering its own panoramic view of the South China Sea. 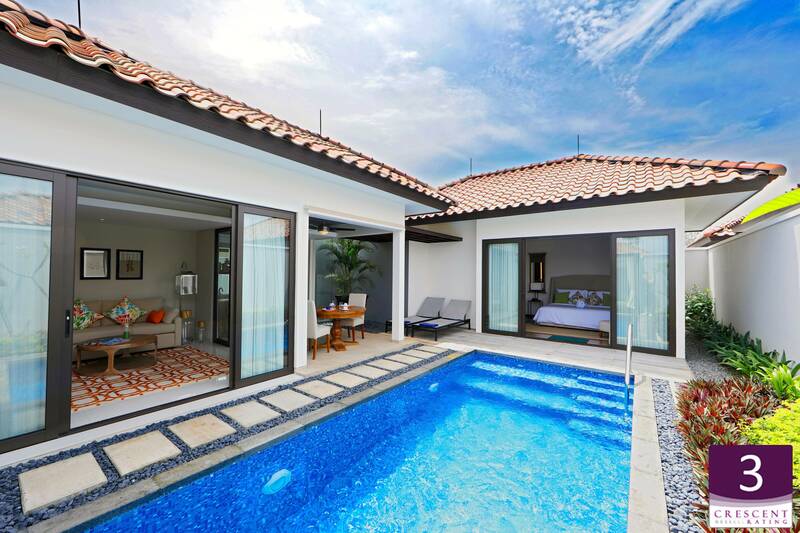 The Two-Bedroom Banyan Pool Villa is highly recommended for a family stay, which comes with an open-air relaxation pool. Apart from the villas, Banyan Tree offers an 18-hole golf course at Laguna Golf Bintan, award-winning spa services, meeting and wedding facilities. Enjoy a private, tranquil vacation while rejuvenating your senses at the Banyan Tree Bintan! Click here for Muslim-friendly travel tips for your holiday in Indonesia! 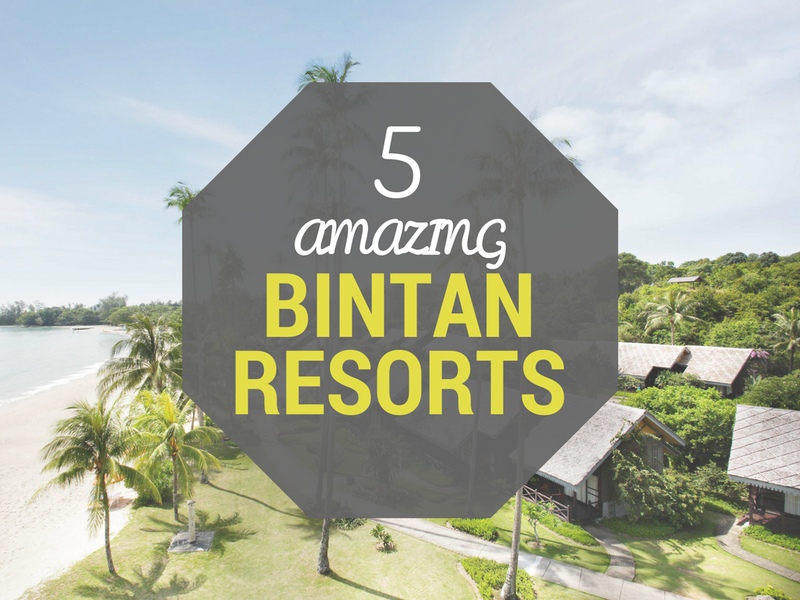 Check out the best Bintan resort to spend your next vacation for lowest price!